The use of Scanning Electron Microscopy (SEM) technology is an invaluable aid whether characterizing products or resolving failure analysis problems. 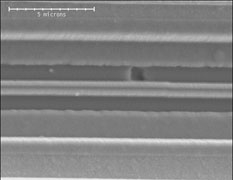 IC contamination identification, electrostatic discharge damage,and IC micro-crack location are only a few of the uses of SEM when performing failure analysis. Other applications include the evaluation of materials (elemental analysis, mechanical damage, etc.) and quality control evaluations such as dimension verification, plating/coating thickness, and weld cross-sections. The Scanning Electron Microscope scans a focused beam of electrons across a small area of a sample. This focused electron beam generates several useful transitions depending upon the electron beam energy and the sample material. Secondary electrons are a type of low energy electrons that are the primary transition used in SEM analysis. The secondary electrons are useful for imaging the topography of a sample’s surface. Silicon Cert Laboratories offers these Scanning Electron Microscopy analysis and Energy Dispersive Xray Spectroscopy services to our customers using our Amray 1610 SEM with LaB6 filament. Backscatter electrons are another useful method of analysis. These electrons are the results of reflected (or backscattered) primary beam electrons from the sample. Backscattered electrons are useful for compositional analysis since their yield increases with the sample’s atomic mass. Characteristic Xrays are generated by the primary electron beam through interaction with sample’s atoms. The energy of these Xrays can be used to identify the parent atom. The technique used to identify the characteristic xray is Energy Dispersive Xray Spectroscopy (EDS). Other useful SEM techniques, particularly for the IC analyses, are voltage contrast and Electron Beam Induced Current (EBIC).